Gator got better! The Gerber Gator II is the next generation of the revolutionary knife grip technology that took the industry by storm. Enhanced with more ergonomically shaped handles, notched spine grips and built in thumb rests, a Gator II folding knife will fit your hand like a glove while you slice through the toughest jobs with ease. 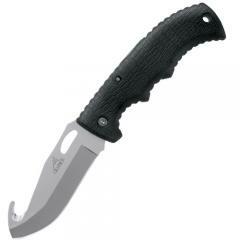 The added hole in the blade gives you the ease of one-handed opening. The included thermoformed ballistic sheath has an extra pocket to hold an optional gut hook.